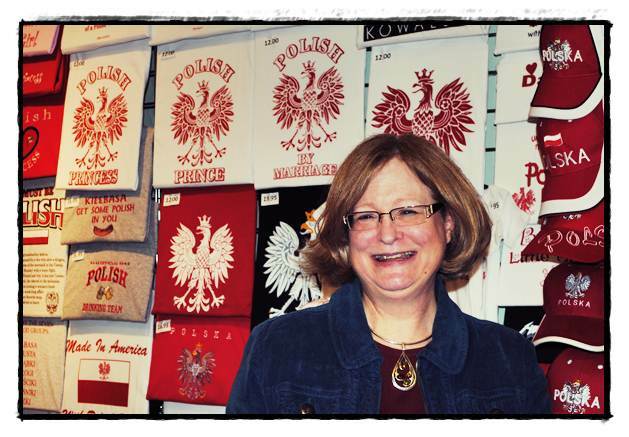 Who is she?A Hamtramck fixture for the better part of 40 years, Joan Bittner is the co-owner of the Polish Art Center along with her husband, Raymond. As a multi-talented businesswoman, artist and activist, Bittner has her hands full with just about everything – from the hand-woven baskets that she makes herself to the “Countdown to Packzi Day Festival” that she helped create. We caught up with Joan earlier this week to find out a little more about one of Hamtramck’s favorite residents. Though you’re now one of Hamtramck’s movers and shakers, you weren’t always a resident of the city. What was it that brought you here, and besides owning the Polish Art Center and a house here, what makes you stay? Bittner: As you mentioned, the store, which the original owner opened in 1958, brought us here. My husband and I both felt that we should support the community in which we did business. When it came time to expand, we made the decision to stay in Hamtramck. We wanted to be part of the solution, not part of the problem! When we moved from Farmington Hills to Hamtramck everyone thought we were a little crazy, but for us it made perfect sense and it cut out driving times, snow days and helped us grow our roots here. I love the walkability of the city – not so much in weather like this week, I never get a ‘Snow Day (laughs). I can go anywhere in 20 minutes – Downtown, Canada, Novi, the Grosse Pointes – Hamtramck is the epicenter! Everyone knows each other and neighbors care about each other. Try to find that same level of community life in the suburbs! Speaking of the Polish Art Center, I hear there is a pretty good story on how you and your husband Raymond came to own it. Care to elaborate? Bittner: On one of our shopping visits to Hamtramck we stopped by the store and the owner mentioned that he was retiring. Since Raymond was going to Poland every year to visit family anyway, we thought a Polish import business would fit perfectly into our future. Our parents weren’t as convinced – we were both single, in college and only 23 at the time – but let us take the plunge anyway. We married the following year at St. Florian’s and after returning from our honeymoon in Poland starting looking for a place to rent – what’s the point of renting a place while you’re on your honeymoon?! So, we bought and ran a business together instead of living together! Our first flat just proved what a great idea it was to move here. Where else could you rent half a house for $90 a month? Wow, talk about jumping headfirst into things. Do you approach everything with that much gusto? Bittner: Gusto, or you could call it looking for a challenge. I seem to like doing things that are not so easy. I am (or was) a green belt in Judo during my high school years, and I also played (or attempted to play) in the High School Band. My math teacher would have something to say about me running a store, as math was never my strong suit! For that matter, so would my Spanish teacher, who would be surprised that I actually can communicate in a language other than English! No, I didn’t know even one word of Polish when we bought the store. I took classes at Wayne State University and learned from the customers who came in. Also, I grew up camping and I taught my children to do primitive camping – it’s another challenge I took the hard way! We took them all over the United States and even went backpacking with them. Well you’re just a regular Joan-of-all-trades, aren’t you? Speaking of trade work, I hear you hold a pretty historical designation. Would you mind explaining what it is? Bittner: Well, I worked my way through college with the most interesting job just before buying the store. I became the third woman working at Chevrolet – Livonia stacking bumpers on the line, and later I became the first woman skilled-trades apprentice! Tool and Dye was the trade that I spent about 8 months in before I left to work in the store. Who knew then, but my Journeymen (the instructor) was Polish, and he later became a customer! Switching gears — no pun intended — you’re on the Hamtramck Historical Commission and the Downtown Development Authority. For our readers who aren’t familiar with those organizations, can you tell us a little bit about them and why they are important to the city? Bittner: History is very important, and remembering history is how you go forward. So, I became involved in it – I helped acquire pieces of past history and stored them because we didn’t have a museum yet – and we felt that we should have some way of recording what happened. So the Hamtramck Historical Commission is the city’s official historical organization, and, for the last 12 years, it has been gathering information and artifacts in order to build a museum, which we now have. The new challenge is getting it open! As for the Downtown Development Authority, I started with the Streetscape Committtee because I felt that I would be able to have some input in the way Jos. Campau was presented from a business perspective. The DDA helps promote the development of the city’s businesses district on Campau and entails the areas all the way from Carpenter to the viaduct. The main district is from Caniff to Holbrook, because that’s where the street narrows. We have worked extensively to bring commerce back to the city, and were responsible for the sidewalk sales, getting cameras installed, the holiday street lights – we try to make things better for businesses in the area! Those are some worthwhile things to be involved in. For better or for worse, how has the city changed since you’ve been here? Bittner: The streets have never looked as good as they do now, with the trees – I can’t tell you how many years I looked out the door and didn’t see any greenery, and now there is nature and that is nice. But we still have the pigeons, for better or for worse. We still have some empty stores, which is interesting because that has always been the case. There are more now, but there isn’t a city that can’t say that. I think we still have a great diversity in our shops and some of the best dress shops and tailors in the area – do people know that there are tailors in the shops? And when I first moved here, there were only a few restaurants, and now look what we have! What about the level of involvement by citizens of the city? Bittner: I have to say that I am proud of the level of capable and willing people in the city that have a passion for making Hamtramck a better place to live and work. People are constantly reminding me that the city is in dire straits, but we’re getting a museum, our art cooperative is gaining strength, and our library is doing fabulous. The recycling program is also coming into its own, so there is a lot that is positive and encouraging going on in the city. What improvements would you like to see? Bittner: I would like to see more merchant involvement in promoting Hamtramck as a great place to visit. And what kind of effect do you think that would have on the city? Bittner: I’ll tell you what kind of effect that will have on the city, because it’s already had an effect. AAA has put us in their tour guide telling people to stop by our store, and many people are doing so. And those people don’t only visit the store; they go to the restaurants and bakeries and meat markets and soon the museum! Merchants would be wise to realize this and pay attention to their storefronts. For instance – if you have an empty storefront next to you, if the area in front of it could get cleaned up as well, it makes the city that much nicer for everyone. The same goes with snow and graffiti – if it gets removed immediately it makes the city much cleaner and nicer and raises the level of pride for everybody. After nearly four decades of living here, where do you think Hamtramck is going? Bittner: Decades – do you know how old I felt when you said that? And four of them, whew! I think it’s going up, absolutely. Detroit is coming back – when we first bought this store we thought it was on the cusp of coming back, but who knew it would take this long to happen? Look at Wayne State – when I first bought the store it never felt like a university, because it just had a few buildings here and there, and now it’s a major anchor for the area. The trend is reversing – people are now moving into the city rather than out. That’s what is going to be bringing people into Hamtramck, and our citizens should be wise to realize that and take care of their property. The values will only go up. Thanks for taking the time to speak with us. Now that I’ve bombarded you with questions, would you care to add anything? Have at it. Bittner: I think the thing that I would like to say is that, don’t just complain about something – find out ways to make it better. That’s why I joined the DDA. There are plenty of ways to get involved and help make a difference. And right now it’s a good time, because there are a lot of community projects available, like community gardens, programs at the library that would be happy to have volunteers, and festival committees – you can see what happened last year when people stepped in to make a difference. Next month we have a Paczki Bake Off and Countdown to Packzi Day on March 5, and everyone can have the chance to have a little Polish in them with a free Packzi (one per person) – we hope to see you there!